JINMO's 111st solo album, it's crowning the title "Yuuwaku" (Tempation). "I'm attracted to Ryunosuke Akutagawa's works in 1927. In particular, to "Yuuwaku" and "Asakusa Koen". As if it synchronizes with Andre Breton's "Manifeste du surrealisme". Both of them were written in the same period, as if the consciousness on the edge was propagated on the lightning blue discharge. "(JINMO). JINMO mentions 2 artists when he answer the question about artists who has influenced him, and he answers as follows; "I learned 'the flesh (how to use the life)' for being an expressionist from Picasso, and 'spirituality (how to use the nerve) ' from Ryunosuke Akutagawa." About Ryunosuke Akutagawa, the source of "spiritual inspiration" for JINMO, he has depicted the mental scenery of the last day of Akutagawa's life in his album "Ryu's Nerve" which was released in June 2008. 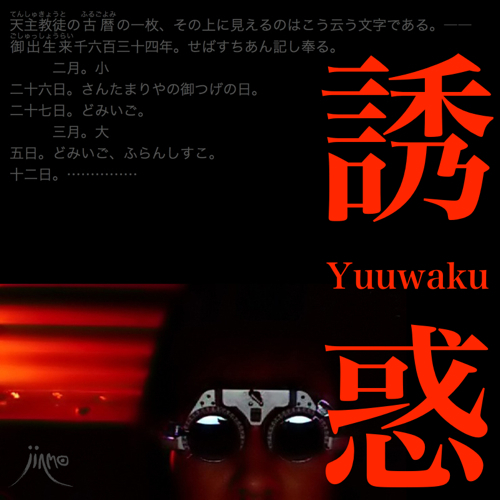 This album "Yuuwaku" would be JINMOic acoustic reflection for his most favorite story, Akutagawa's "Yuuwaku" which written just before his death. JINMO considers that Akutagawa's "Yuuwaku" is the earliest reflection in Japan for new expression in Europe which was started with Andre Breton's "Surrealist Manifesto" which was written in 1924, three years before the writing (his death). Moreover, he considers that "Ryunosuke Akutagawa's short stories in the 1927, 'Yuuwaku' and 'Asakusa Koen', I can't help feeling that they are quite music more than being figuratively musical. and his writing posture at this time, it was close to composing rather than writing". "Yuuwaku" is now into the sound "Yuuwaku". Similar to "Yuuwaku", I feel that every short chapter would be woven beyond time and space, the sounds are tinged with an intelligent but primitive power as if they encourage listeners' spirituality. Just after the completion, I saw that JINMO recited "Yuuwaku" with playing this album on speaker. Two "Yuuwaku" entwined with each other, and made beautiful symphony of the sound and the story, I thought it is not just background music for his recitation. For everyone who purchased this album, we appended full text of "Yuuwaku" in addition to the sound source to try the symphony of the sound and the story. Cover picture is self-portrait by JINMO. Cover art is also designed by JINMO.